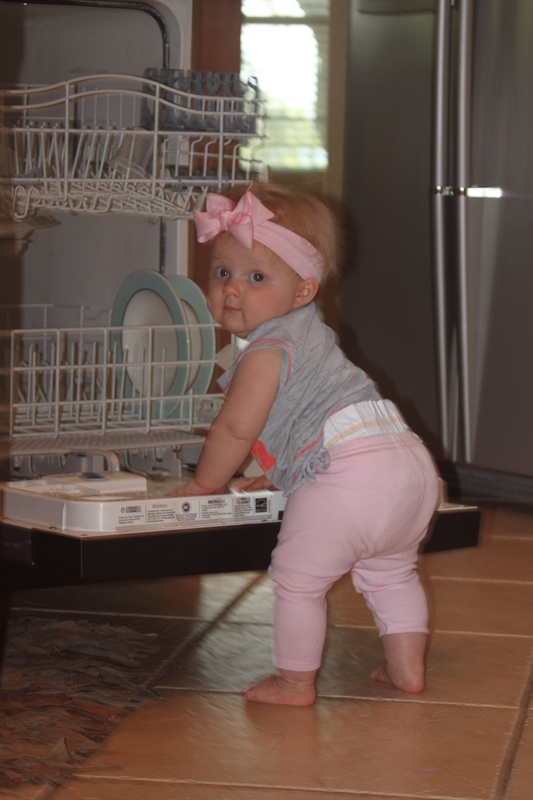 Landri learned to crawl into the dishwasher!!! What??? How did she get this grown up? 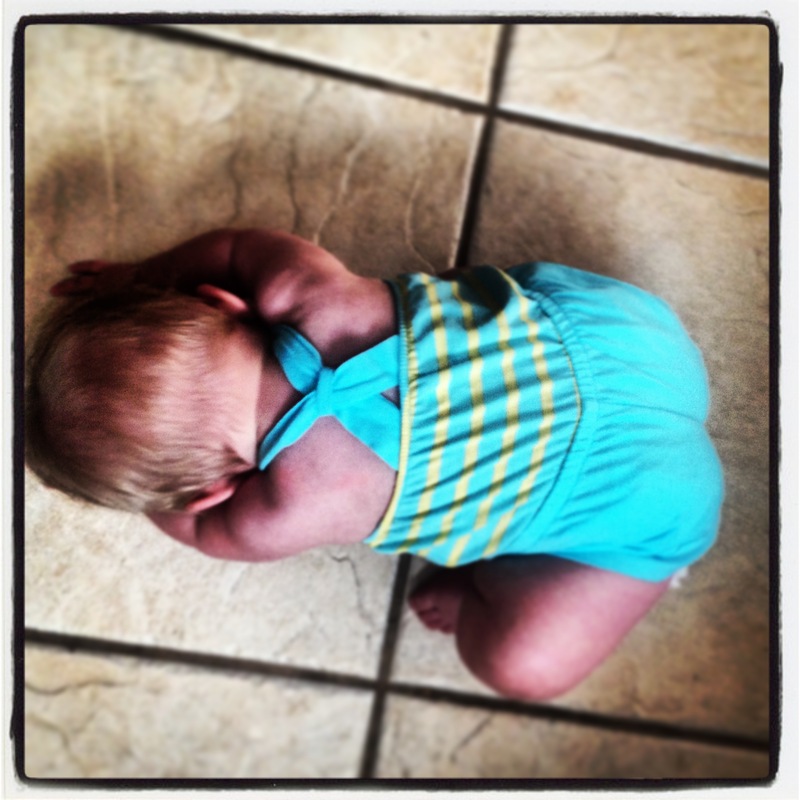 Also, she has learned the art of the baby temper tantrum. While sitting on her bottom, she throws her upper body forward on the ground while screaming until you do what she wants you to do. Not sure if you noticed, but there was a picture documenting this Landri phenomenon in her swim suit photo shoot. Of course I’m a sucker too when she does it. So whooped by this tiny human! I will post a couple pics below. I’ve got another awesome recipe from Annie. I have made it several times for Scott, my neighbors and my neighbor’s parents and I’m getting requests for the recipe so I thought I’d post here. It is very rich so I suggest 4 servings from the recipe below. It’s really easy and not bad for you at all. To keep it healthy, select a dark chocolate bar with around 70% cocoa. Read the ingredients on the labels at the store and pick one with a small amount of ingredients that you recognize (i.e. not asdhiurhlghjljfasaatanyfsian phosphates, LOL). Also, just a note on the tofu – I use the box kind (not refrigerated) which I get at Whole Foods in the International Flavors isle. I have yet to find it at our HEB, sorry. Melt the chocolate, either on the stove or in the microwave. Then throw everything into a Magic Bullet or food processor and blend until super-smooth. (If your food processor is really big, or if you’re using a blender, it might be a good idea to double the recipe in order for the contents to blend.) Put in fun glasses (I use 4 martini glasses for this recipe) in the fridge for a couple of hours before you enjoy. 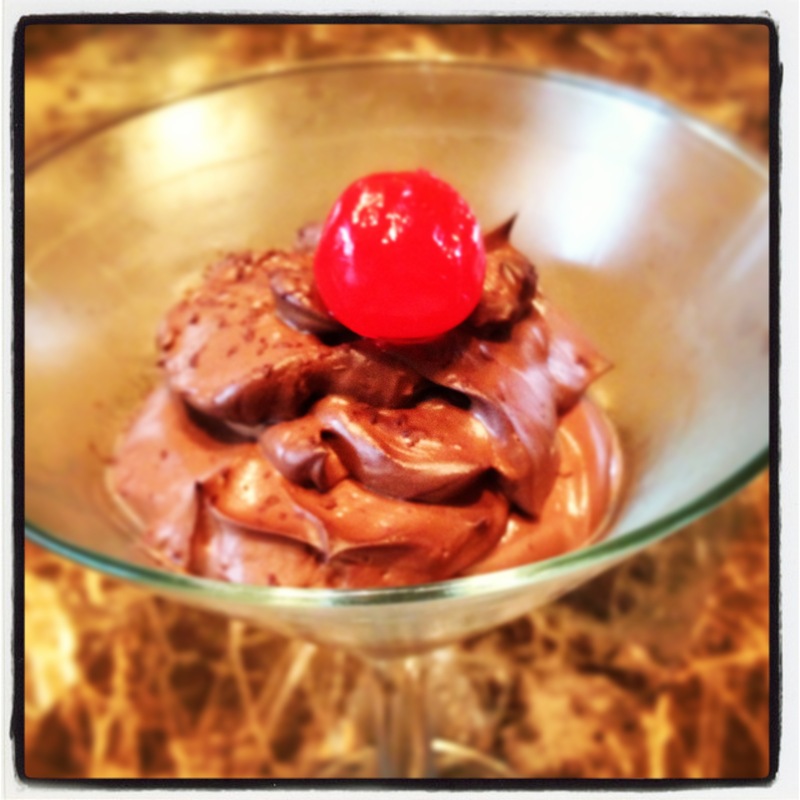 If you really want to get fancy, you can even add chocolate shavings and/or unsweetened coconut on top with a cherry! please tell me that is a healthy maraschino cherry on the top of your mouse! talk about foods with questionable ingredients you can’t pronounce! that looks yummy you could write a book and I would buy it.